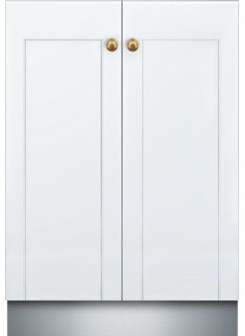 Thermador has a new dishwasher, the Star Sapphire dishwasher, with some unique features. In many ways, it revolutionizes how you will use a dishwasher, especially if you are often hosting friends and family. 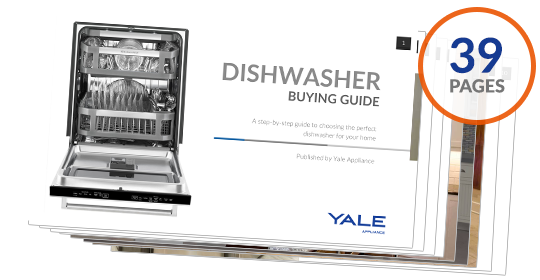 In this article, you will learn about the Thermador Star Sapphire dishwasher,it's new features including its incredible speed and drying capabilities, as well as its similar features to their Radiance Collection. Lastly, we will compare it to a similarly priced dishwasher from Miele, its only true competitor. First, let’s take a look at Thermador's new Radiance Collection starting with their brand new Star Sapphire dishwasher. In the past, Thermador was a Bosch dishwasher. 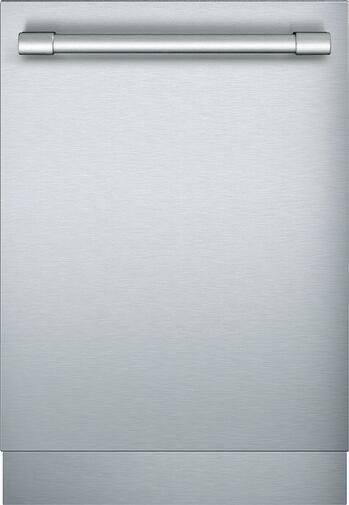 Ironically, most of the Thermador dishwashers were made in Bosch’s European factories. Now, Thermador's dishwashers are made in North Carolina. This dishwasher is unique for its speed and drying capabilities. At 20 minutes for the main wash, the Star Sapphire is the fastest non-commercial dishwasher on the market by far. However, unlike a commercial dishwasher using 240 volts and 50 amps to heat the water instantaneously, the Thermador heater will take 20 minutes to heat the water to 151 degrees and then you can use the 20-minute cycle. So you would turn it on before dinner and have it ready by the time you clear the dishes. If you are having a party, you can run 5 loads with the hot water in reserve at 20 minutes per cycle. The drying is incredibly unique. It uses regular condensation drying but adds the mineral Zeolite to speed the process. If you Google Zeolite, it has been credited as a supplement to release toxins from your body like Mercury, Arsenic, and heavy metals. The Russians used Zeolite at Chernobyl to remove radiation. It also has been used for water purification through osmosis. It's thermal and adds heat as well as absorbs more moisture for a more efficient drying process. Thermador has packed a lifetime supply of Zeolite, so you never have to worry about it running out. 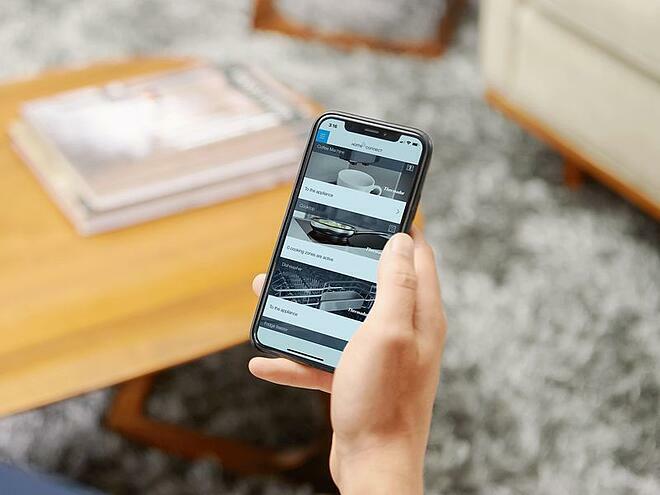 Thermador HomeConnect: Wi-Fi enabled, so you can turn on the dishwasher remotely as well as see the cycle time remaining. 3rd rack: You can place your silverware on the top rack, so you will have more room for the dishes below. Three Styles: You have a choice of Euro or professional handles.  You can also panelize every series. $1,399 Rebate: You have a $1,399 rebate when buying a pro range or qualifying Thermador cooking products. PowerBoost: This cycle adds temperature and water pressure on the bottom rack to clean extremely soiled dishes. 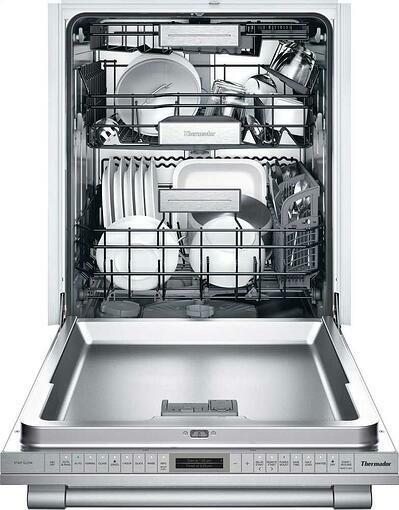 At $2,799, Miele is the only competitor in that price range of the new Thermador Star Sapphire dishwasher. 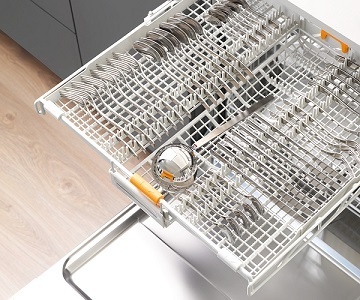 Miele's Diamond dishwasher dries by allowing air into the sides of the dishwasher. The hot steamy air is attracted to the cooler sides and is dissipated. The door on the Miele pops open at the end of the cycle to release some of that moist air as well. For speed, Thermador is the fastest with their 20-minute wash cycle. Miele uses way more time than the Thermador. The normal cycle is over 2 hours with a short cycle of. The racking on the Miele is the best as the racks are adjustable and can be removed to fit any kind of utensil or plate. 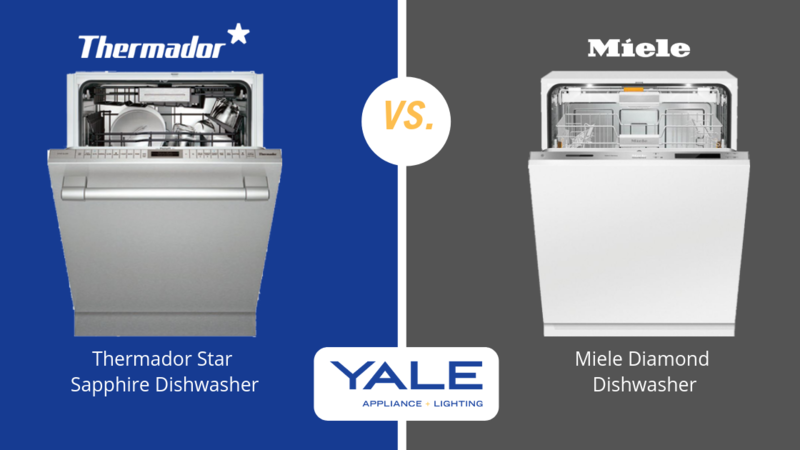 Thermador is close, but Miele is still more flexible. In terms of reliability, Miele is also the best premium dishwasher. Oddly enough, the German-made Thermador dishwashers faired worse than the Bosch dishwashers made in the U.S. Still, Miele would be the most reliable with Bosch being number 2 combining all their brands. So, Should You Buy the Thermador Star Sapphire Dishwasher? I have a fairly quiet dishwasher with a 2-hour main wash cycle. The dishwasher is turned on before bedtime. However, if you entertain, that 20-minute cycle on the Thermador Star Sapphire is a plus. We will test the Zeolite drying claims shortly. Miele does dry with a more basic design. In terms of value, the Sapphire is a great idea, but $2,799 is not a price most people are not willing to pay for a dishwasher, especially with many less costly, viable options in Bosch or KitchenAid. However, if you buy the Thermador professional (pro) range, you do receive a $1,399 credit towards a new dishwasher, then the Sapphire becomes more affordable and worthwhile at $1,000 (without the Speed cycle) or $1399 with that cycle. At that price, it is only $300 more than a comparable Bosch with far more features like Wi-Fi, PowerBoost, Star Speed, and StarDry. It also becomes over $1,000 less than a Miele Diamond. With the discount, Thermador becomes almost a great value. At $2,799, it is a much tougher buy.